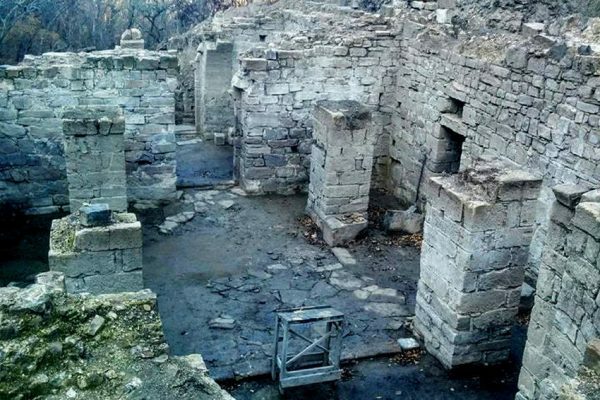 Moscow, November 16, Interfax - Staff members of the Crimean Archeology Institute at the Russian Academy of Sciences discovered a medieval cathedral not far from Sudak. “Scientists of the Russian Geographic Society held geoscanning and it cleared out that the building stands on the foundation of an older building and several buildings nearby were covered by soil. Perhaps, there are monastic cells underground. It is clear that an entire monastic complex functioned there ten centuries ago. Quite possible that it is an ancient monastery of St. John Chrysostomos!” head of the Crimean State Council Committee for Building and Public Utilities Leonid Babashov was quoted as saying by the Rossiyskaya Gazeta website. The cathedral was not mentioned in any source. Local residents accidentally found its fragments last spring, then archeologists started excavations. The square of construction is about 200 square meters. Scientists believe it is the biggest known Byzantium Orthodox cathedral on the peninsula. The church was abandoned in 1475 when Turks invaded Crimea. Coins, pieces of ceramics, Turkish arrows and traces of fire witness to it. Today the task is to conserve the object, which requires about $160,000, the articles reads.